Ensuring your chicks do not “get chilled” will help prevent “pasting” and support a healthy start. 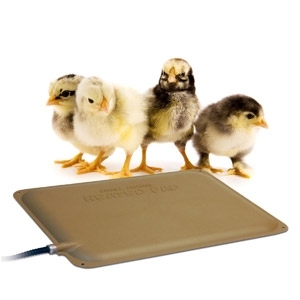 Only 25 watts makes the Thermo-Peep™ Heated Pad the most energy efficient heat source on the market for your peeps. We even capped the cord entrance and the first 18” of the power cord with steel for the ultimate safety and well-being of your birds. Holes in the four corners allow for screws to anchor the pad on wood surfaces or wired in place with traditional chicken coops. For use in an enclosure. MET Listed. One year limited warranty.